Knowing how to plan for and respond to catastrophes such as tornadoes, floods or earthquakes is one of the most important things a homeowner or business owner can do. Safeguarding your life is the most important thing you can do, before, during and after a disaster. 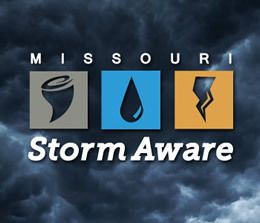 Get StormAware and learn how to stay safe during severe weather: stormaware.mo.gov. If your home was seriously damaged contact your insurance agent or your insurance company's toll-free claims number as soon as possible. Some insurance companies set up mobile claims units with staff in areas hit hard by storms. Keep a record of the time, date, topic and name of person you talk to every time you call. For help with company contact information use company lookup, E-mail us or call our Insurance Consumer Hotline at (800) 726-7390. Survey the damage and take pictures or video if possible. Make temporary repairs needed to prevent further damage. For example, a hole in the roof should be covered by a tarp or other material to keep out rain. Same goes for a broken car window. Otherwise, further damage will likely not be covered by insurance. Keep receipts for materials you buy so you can be reimbursed. Make a list of all personal property destroyed or damaged. Note the approximate date, price and place of purchase and attach any sales receipt you have. The adjuster will request this information. Create a home inventory. Don't make permanent repairs until your insurance company has inspected the damage. If you do, your claim might be denied. Ask your insurance agent or company if your policy covers living expenses until repairs are made to your home. Many homeowners policies provide for temporary lodging and meal expenses up to 20 percent of the insured value of your home, if it is damaged. Let contractors inspect your home only when you're watching. Some unscrupulous companies will cause damage to drive up the repair cost, and your insurance company will likely not cover the additional cost. Your insurance company should send its adjuster to your property. Make sure your adjuster and company can contact you. If you have to move, give your insurance company and adjuster your temporary address and phone number. Make sure the adjuster has identification. Remember that insurance companies pay the adjusters and you should not be asked for any payment. If you believe your insurance company has not handled your claim properly, file a complaint with us. We will determine whether your insurance company has followed Missouri law in processing your claim. Once your claim is processed, choose a contractor and let them review the adjuster’s estimate to make sure it includes all loss related damage. Choose a contractor or auto repair shop known to you or recommended by someone you trust. Be suspicious of solicitors who offer to do repairs for you. Don't pay the whole repair bill in advance. Pay in full only when the work is completed according to your agreement. A "public adjuster" - a person licensed by the state - may offer to represent you in claim negotiations with your insurer. Public adjusters will seek part of your settlement as payment for their services. You are not required to hire a public adjuster to file a claim. Generally speaking, consider hiring a public adjuster only after your insurer makes a settlement offer and when you anticipate any settlement increase obtained by the public adjuster will exceed the extra cost. If you are receiving medical care and need help determining what is covered under your policy, contact your health insurance provider as soon as possible. If local health care facilities are heavily damaged, you may have to go outside your network to get the care you need. Contact your insurance provider to find out what is covered, and what providers are inside and outside your network, and what out-of-pocket costs you can expect to pay. Damage to care facilities may also require hospitalized individuals to be transported to another facility. This also may trigger out-of-network costs, which your insurance provider should be able to explain to you. For help with company contact information use company lookup, Email us or contact our Insurance Consumer Hotline at 800-726-7390. Because we license agents and insurers, we can help resolve many disputes about contract language and state legal requirements on coverage. In 2016, we helped policyholders collect an additional $16.4 million in settlements from their insurers. For policies such as homeowners, four of every 10 complainants gets additional financial relief. The agent or company does not respond to your calls. The company denies or does not help arrange for temporary lodging and other assistance specified in your insurance policy. The company says your policy does not cover your property damage. If you have not purchased homeowners or renters insurance, you should arrange to do so as soon as possible, unless you can afford a loss. A homeowners or renters policy will protect you against a devastating loss. DIFP encourages you to talk with an insurance agent about the various policy options. Flood and earthquake damages are not covered by basic homeowners and other residential policies. Earthquake coverage is available in some areas as a special add-on to your homeowners insurance. If you live in an area prone to flooding you will need to buy a federal flood insurance policy through your agent to cover almost any flood damages. Review your insurance policy each year to make sure coverage is adequate. Prepare a detailed inventory of your household furnishings with photographs of each room in your home. Make a list of other valuables and equipment that don't appear in the photos. Put these materials in a safe place, such as a safe deposit box or with a relative. Have a plan of action. Select a shelter or location. Make a list of important telephone numbers and know how to contact family members. Remember to include your insurance agent and insurance company. Check out other online resources. Missouri's "Ready in 3" program has information available on non-weather disasters.